Even in Yahoo Mail Classic, you had the option of changing the look and feel of the interface - this remains true in the "All-New" Yahoo Mail (currently version), as well as the current 2010/2011 Beta of Yahoo Mail. 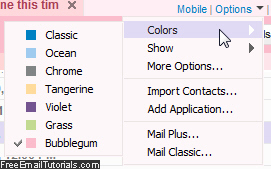 This is the easiest way to customize your favorite webmail client by giving it a touch of color that fits your taste. If needed, first login to your Yahoo Mail account; once inside your inbox, look for the "Options" dropdown menu near the top right corner of the page, and click on it: from the menu that opens, click on the "Colors" submenu. Notice that each color theme in the Colors submenu includes a tiny swatch that lets you preview the base color of the scheme before you actually apply it to your email account. But since the change takes effect immediately, and loads within a couple of seconds, you can just try each Yahoo Mail theme, one after the other. After trying different colors for your Yahoo email account, you will have noticed as well that the base colors shown on the sample swatch is just the beginning: Yahoo has actually created a special style sheet for each theme, which also defines custom colors for the mouse over effects, menu colors, mouse over colors of emails and menus, etc.